Way to cheat that cliffhanger, Dan! Not only did you have time to turn on your lightsaber, you had time to move it up the path of the star before it could close a six inch gap! Which was a two inch gap when we broke last issue! 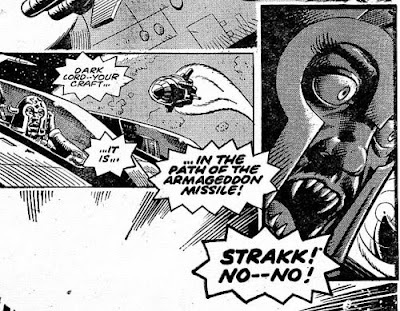 As the Dark Lord makes good his escape, Dan fends off the deadly flying star. Which is an entirely separate thing from a Death Star, it’s important to understand. Dan finally manages to destroy the thing, but not before the Dark Lord has escaped onto Dan’s landing craft. As he blasts off he uses its radio to call in some new orders – destroy everything in orbit! And that’s it. Killing the Dark Lord has destroyed the entire empire. ‘But Count’, you may ask, ‘couldn’t they just keep firing the missiles and wipe out Dan’s ship and the entire commandeered fleet?’ Excellent question, but you’re forgetting one thing: In a decision that made the whole enterprise a huge ego boost for the Dark Lord, but also the least-efficiently run empire in the history of tyranny, an edict was made that all decisions – from the loftiest planet-subjugating strategies to the catering menus at all StarySlay mess halls – must be run through the fearless leader. As a result, when the Dark Lord was blown up, the central decision-making unit through which the entire empire was taken out as well. At this point, none of the Starslayers are even capable of flipping a light switch. With the reins turned over to the various slave races of the empire (remember them? The wookies, Romans, and bug-men?) , it’s time for Dan and his crew of misfits to go rambling on to their next destination, as well as its next threat. What form will this new villain take? A pack of space-wolves? Zor, the living planet? Perhaps malicious robots made of ice? Who knows what mad twists the future has in store? Well, at least it’s no longer ‘You were just an ordinary guy, weren’t you, Frank?’ And this is quite an in medias res opening, isn’t it? When last we saw Frank he was fleeing form a shotgun-wielding neighbour of his girlfriend. And now he’s scaling the side of an apartment building. Because… um… Maybe we’re in for one of those ‘six hours earlier’ type of deals? I guess not. But I do love how quickly Frank has adopted the language of the sci-fi outcast. 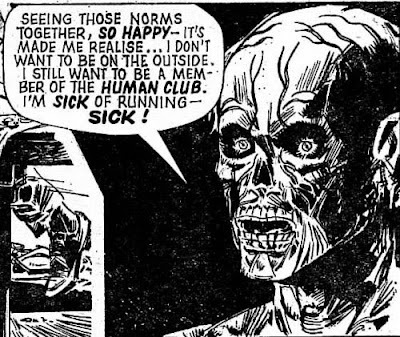 He’s only been a monster for a week now, and he’s already calling himself a freak, and referring to everyone else as ‘Norms’. So what does he decide to take? All the food at a wedding reception! So Frank decides to turn himself over to the evil doctor Burnard, so long as he’s promised a cure at the end of the tests. 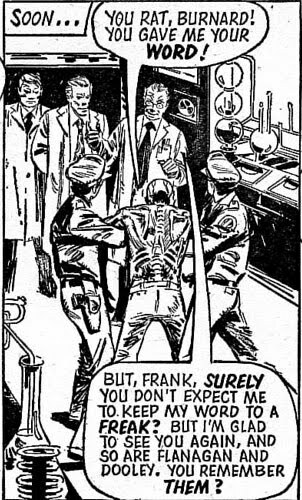 This leads to almost immediate betrayal, with Burnard having Frank nabbed by the cops and dragged back to the nuclear research centre. Oh, Freak and Norms – will you ever make peace? The evil doctor Burnard promises him something worse than a few ordinary diseases like typhoid or yellow fever. No, the doctor has something especially cruel in store for Frank. What is it? Tune in next week to find out! Little do they know that at this very moment, a group of aliens are planning to invade the earth – which they haven’t quite located yet. I see at least one problem with their scheme. Then, in what might be referred to as a classic case of overcommitment, they decide to dispatch their entire fleet just a few minutes behind the probe. The disposal area is the sun! You know, it’s possible that I don’t understand the meaning of the word probe – if it doesn’t include the ability to detect that it’s headed for an incredibly large energy source – a sun, for example, then what is it for? Other pieces of technology that should be able to detect that they’re headed directly for a sun include: Spaceships. 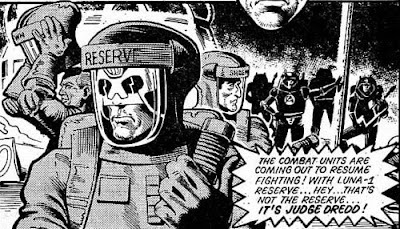 That’s right, in the future wars are resolved by teams of designated combatants killing each other in gladiatorial bouts. Occasionally these bouts are fought by men who don’t know how to hold their weapons, and fire wildly in the air. Don’t you love how even though the way the guy is holding the gun makes no sense at all, he’s still awkwardly pushing the trigger with his thumb. 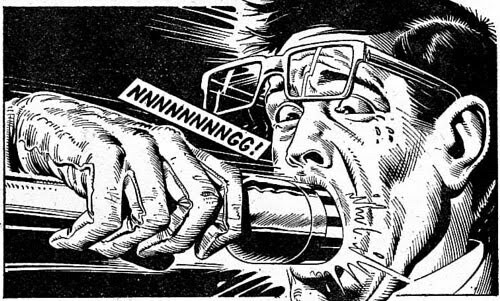 Ah, Bolland – even when your art makes no sense, it’s still gorgeous. And also make your entire body explode when they hit, while leaving your suit relatively intact. Ick. Makes you sick to think of people watching this as entertainment, doesn’t it. But reading it as entertainment? That’s cool. The sovs aren’t satisfied with their superior weaponry, however. No, they also decide to cheat by drugging the Luna reserves! Which proves to be their fatal mistake, because who should offer to take the replacement’s place on the team? Two helmets, damn it. That’s how you go to war. 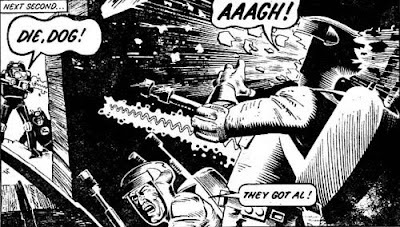 Dredd and his sidekicks quickly disarm the Sovs and force their surrender. 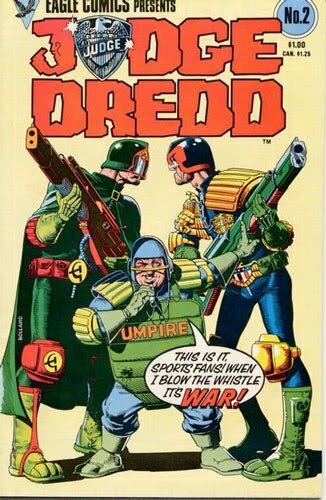 With the war over, Dredd has a few choice words for the media, who have been covering the war with characteristic hyperbole. Then he commandeers the camera and tells the folks at home that while wars may sometimes be a necessity, they should never be thought of as ‘fun’! But, again, it’s cool to enjoy a comic about it. Oh, and also, while forcing the surrender, Dredd finally killed a guy! Judge Dredd Kill Count (42)+1=43! Finally given the opportunity to execute Savage, Georgi makes the classic mistake of underestimating his opponent. Instead of just finishing things, Georgi wants to toy with Savage a little, which gives the smaller man (who’d have thought I’d ever say that about Savage?) more than enough time to find a weapon that sends Georgi sailing off the side of the ship. How did he manage that? Savage kills a sniper with the emergency flare, then jumps over to the yacht. I’m not sure why he isn’t immediately gunned down – apparently there are far fewer guards on the main deck now than there were in the last episode. When Savage gets there it’s pretty much just Rosa left, sitting in her throne. John runs away from her, and winds up shot in the arm for his trouble. Before Rosa can finish the job, Nessie uses her chains to deal with Rosa, in a manner that presaged Jabba’s final fate by a few years. 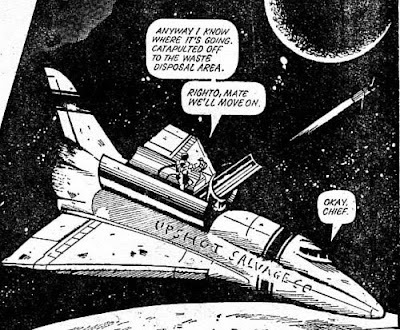 Bill and John take advantage of the confusion and run to the nearest anti-ship cannon, which they employ to blast apart the very hovercraft they’re sitting on! This manages to kill all the Volgs without crippling the ship, so it’s still floating when Canadian reinforcements arrive, along with American jets! The heroes arrive to Halifax and safety, but Bill’s not satisfied. He wants to retake Britain, and he figures he’ll have the Americans’ help to do it once they discover that Nazis killed a boatload of American sailors! 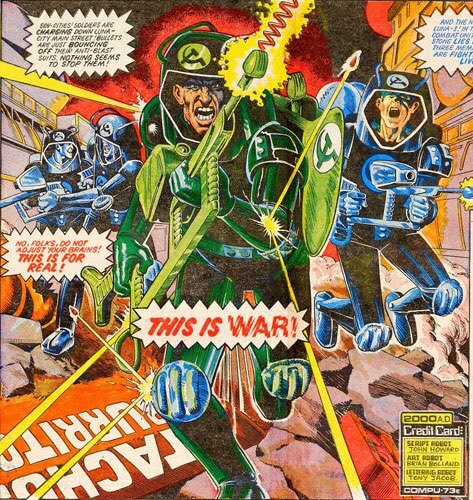 The tag at the bottom of the page promises that the battle to retake Britain will begin soon, once the Americans have mobilized forces, but until then, we’ll have another story in this slot! As excited as I am about the prospect of a full-on war with the Volgs, it occurs to me that the Americans might not be psyched to start a likely nuclear conflict over the lives of a few sailors on a cargo ship. 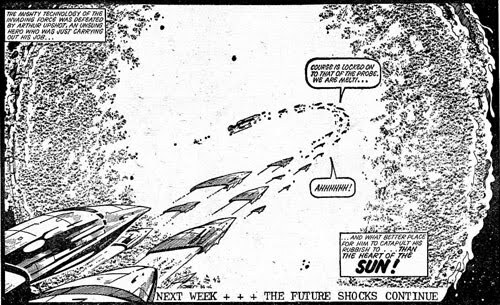 Of course, plausibility was never this strip’s strong suit. It seems that the near-assassination has pushed the Hellcats to the edge of reason. Their Cave Man won’t even get medical attention after getting a massive injury to the head! He’s so vicious in his protests that he winds up getting tossed in the penalty box, which leaves an undersized biker blocking the goal. 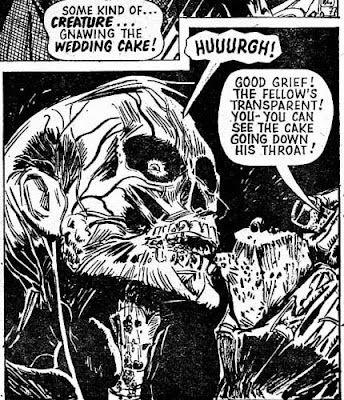 Slim’s so overexcited that he doesn’t even notice that he’s been tagged by some bikers’ grappling hooks until it’s too late. 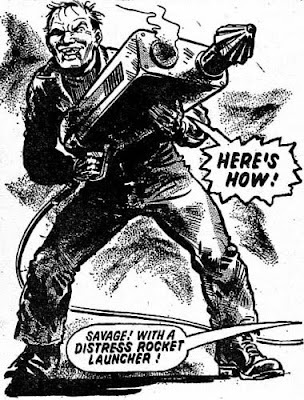 He winds up with an exploded jetpack, and a trip to the infirmary! With two of their best players sidelined, the Hellcats lose the game, proving themselves not ready to be playing in the big leagues. Hopefully the fact that the man is a human peacock will in no way hurt their chances at a championship. Also, I’m not entirely sure where they’re getting the money to pay for all this equipment, players, as well as a brand new Harlem Inferno stadium. I mean, they had their last sponsor sent to prison – are there plenty more billionaires just lining up to take his place? In this single-page gag strip, Dredd has told Walter, his faithful robo-butler, to go drown himself. Walter takes this as in instruction to head to the local pool. He mistakes a ‘pool hall’ for a pool, and wackiness ensues. What do you want? It’s a gag strip. 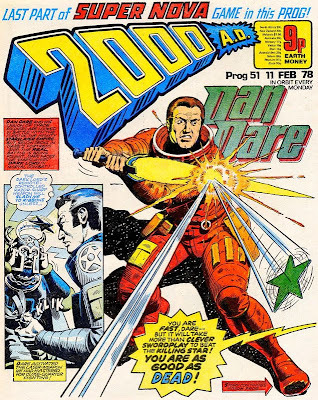 Although, compellingly, next issue promises a visit from Walter’s brother, which promises to open up questions about robot identity, and the relationship between different units of the same model of droid produced at the same time. Are the two robots produced before and after you your brothers? Does it go wider than that? Are all robots of the same model siblings? And whatever happened to Walter girlfriend? I look forward to all these questions being answered next issue! Of course, I will be disappointed. Best Story: Judge Dredd – Bolland Olympics. What more need be said? 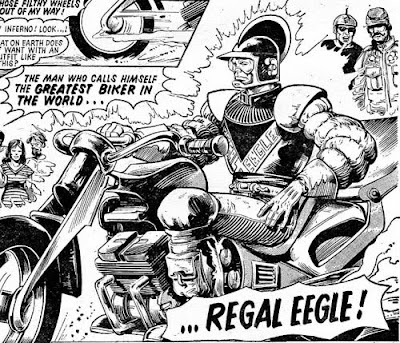 In fact, I'm extra-partial to this story because it's my first opportunity to do something I've wanted to for a while: post Bolland's Judge Dredd covers from the 80s Eagle reprints. I will continue to post these as we reach the relevant stories that they depict. So, first up, here's the cover to Judge Dredd issue 2 - which included the Air Board and Lunar Olympics stories, both by Bolland, of course. Worst Story: Future Shock – I try to cut these things slack, but come on, that was just too stupid.